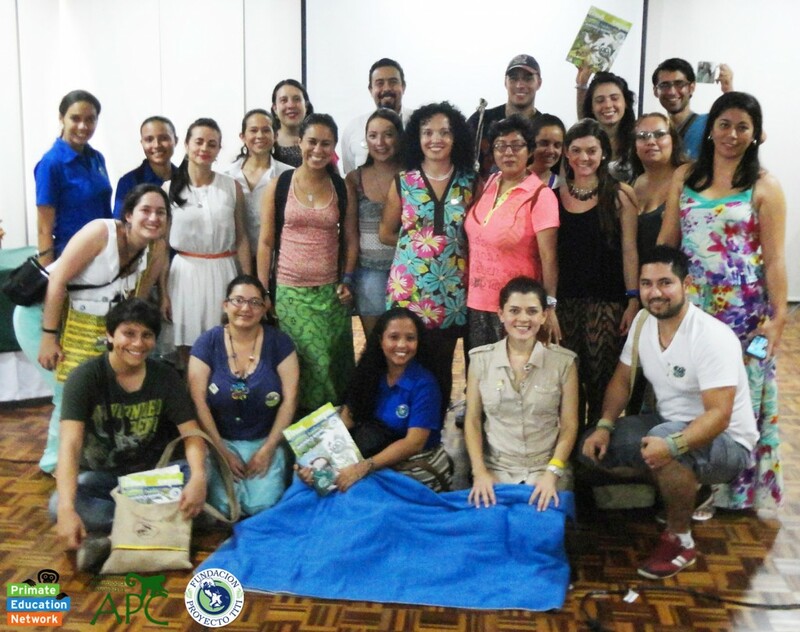 On December 4, 2014, Primate Education Network (PEN) partnered with the Asociación Primatologica Colombiana (APC) and Fundación Proyecto Titi to deliver our second workshop targeting regional needs in Colombian primate conservation education. Our workshop was held at the Hotel Capilla del Mar in Cartagena, Colombia and supported by the World Wildlife Fund Education for Nature Program. Our participants represented various organizations and institutions, including the Fundación Entropika, Fundación Proyecto Primates, Fundación Primates Colombia, Fundación Herencia Natural, Unidad de Rescate y Rehabilitación de Animales Silvestres, Universidad Amazonía, Universidad Nacional de Colombia, Unidad de Parques Nacionales, and University of Texas at Austin. During our “Show & Tell” activity, eight participants exchanged educational materials, ideas, and experiences. Following their presentations, our facilitators led a group discussion and asked participants to provide constructive feedback. Each participant also received consultation and advice from Fundación Proyecto Titi’s Head of Education Johanna Vega and three members of her education team. The discussions covered the appropriate language to use based on the focus group, parental permissions when working with children, questionnaire structures, and the type of messages to use in videos (i.e. positive and negative messaging with clear and simple conservation actions people can take). Participants also shared some of the challenges they faced working with big cattle ranch owners. They concluded that it is important to address political issues and eco-friendly practices before introducing education programs with farmers. Additionally, there was a discussion around ecotourism in the Amazon. The participants agreed there needs to be a multifaceted approach to educating local businesses, communities, and tourists in the region. Our April 2014 workshop participants rated PEN highly in their post-questionnaire responses. They gave our workshop an overall rating of 4.7 out of 5 and our facilitation skills a rating of 4.9 out of 5. All participants (100 percent) found the workshop useful and confirmed that it met their expectations. Additionally, 100 percent of the April 2014 participants who attended our follow up workshop in December 2014 designed primate education programs in their respective regions. This accounted for six new education programs in Colombia. These post-workshop results validate PEN’s mission, approach, and focus on collaborative learning in addressing the widespread needs of primate educators. The focus of our ongoing efforts in the region include following up with participants on their progress and new collaborative partnerships, as well as reinforcing action items. After all of our workshop participants have implemented education activities and tested various approaches at their field sites, we will fundraise for our next training workshop to address newly identified challenges and needs. We will also use our experience to inform and adapt our model for regional differences at future training workshops in other primate range countries where PEN works. ‹ Join hundreds of PEN members who are standing strong to protect primates!